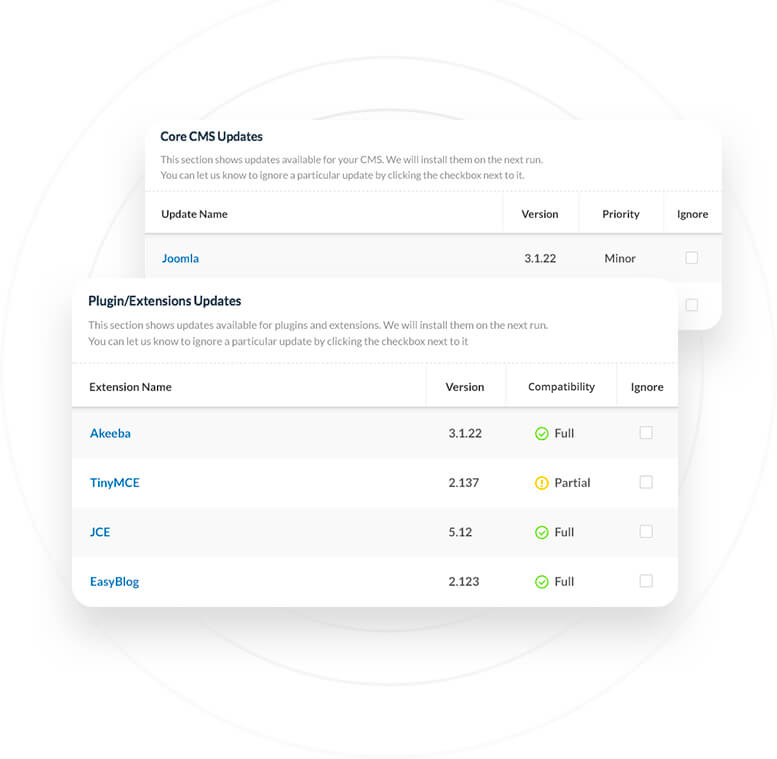 Keep your plugins and CMS updated. At last, a simple tool to keep your website and associated plugins up-to-date! Our new Smart Updater is easy, flexible and effective. View a list of available updates for your sites. You can include and exclude particular updates as needed. We will take "before and after" screenshots of your page to analyze potential update problems. Pick the frequency (daily, weekly, monthly) and preferred time you'd like updates to be performed. If we detect a problem during the update process we will automatically roll your site back to it’s previous state. A backup is created before each update and is available for you to use. You will get an email with the results of the update and the “before and after” screenshots. Fully automated and ready to go. Nobody likes to update websites, but you gotta do it to keep your website secure. Still, it’s time and effort that could be spent elsewhere. That’s where Smart Updater comes in: it automatically creates a restore point for you, compares the website before and after the update, and helps you roll back the update if something goes wrong. Yeah, it’s that easy. Our Smart Updater is available for all clients who have our Business Plan. If you do not have our Business Plan, it can be added for an additional $5/month for each site. Love it! One of the best tools on the market. I don’t know how I could live without it. My life is so much easier now. The CloudAccess.net Platform is built and optimized for Joomla Hosting and WordPress Hosting. We offer support services like free tutorials and an industry-leading Support Team ready to help clients develop their Joomla or WordPress websites.